Manual inventory process is very delicate because you need to be accurate with all the details of your items and if you are not careful you might mislook some products that would possibly result to company loss. This Farming Tools and Equipment Inventory system is an automated Inventory system that focus on managing and locating of every equipment/tools easily. This can also track the stock in and out's of materials and their quantity to see how many materials left. 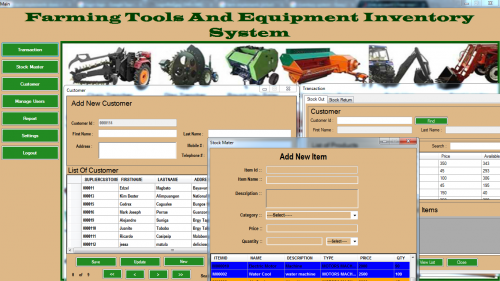 Farming Tools and Equipment Inventory System was made in Visual Basic 2008 and MySQL Database. I used Crystal Reports for creating the report.